As dog-lovers, we all know how dogs often choose inconvenient places to sleep – most commonly, your bed! Give your dog a bed that’s as comfy as yours and they’ll no longer wake you in the night! Transform a corner of your home or upgrade their crate to make it their safe & happy place with a brand new bed or mat. Choose from a variety of different styles, sizes and patterns of beds & mats from quality brands. Choosing quality means your dog’s bed will last at least 5-7 years and can run through the washing machine without suffering any damage. And at The Dog Market you’ll find exclusive patterns and styles from North American manufacturers that aren’t available anywhere else. 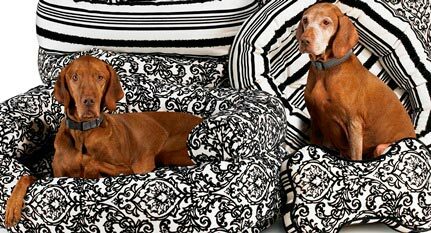 Bowser Pet Products – stylish pillows, beds and mats that you won’t mind leaving out. West Paw – pillow beds and mats made from environmentally friendly recycled water bottles to keep your friend cozy. K & H Pet Products – heating and cooling beds to maintain an ideal resting temperature. If your dog has trouble regulating their temperature in the warmer months, a cooling bed is an excellent way to ensure they get a good nights sleep. On the other hand, if you’d like to give your dog the same comforting warmth as sharing your own bed without limiting your space, a heated bed will give you that ability. Double doors for flexibility at home and in the car. High quality leak-proof plastic pans – removable and easy to clean. Whether you are tired of sharing your own bed or want to banish an old bed that has become an eyesore in your home, we have your perfect option. Stop by our shop in The Beach today to browse all of your options.